Inventor Steve Smith sparked a bidding war when he appeared on the first show of the new Dragons' Den series last week with his trueCall nuisance phone call blocking device. trueCall allows the user to decide who they want to speak to, by using special patented software which screens all incoming calls into the home. The gadget acts as a buffer between the phone and the outside world and learns to distinguish between welcome and unwelcome callers (by an intuitive 'star' and 'zap' feature). 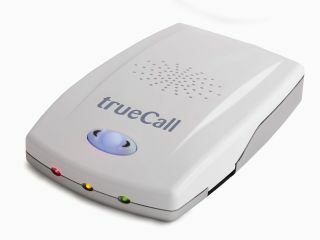 The trueCall works on all home phone lines – even those with broadband – and filters out unwanted sales calls, silent calls, recorded message calls, market research calls, calls from overseas call centres and offensive or threatening calls. trueCall is easy to set up and use and allows you to decide who you want to speak to. The product has been flying off the shelves since it was featured on Dragons' Den and Steve has had to place another order with the manufacturer for a further 10,000. To celebrate the success of the product, trueCall has teamed up with TechRadar to offer our lucky readers six of the devices, worth £97.50 each, in our latest competition. This competition is now closed. The winners are Aaron Healey, Rachel Gladwi, Sue Butler, Phupinder Roopra, Patricia Jarvis and Ewan Bell.